Another one of the treasures in my grandfather’s box of family papers is the surprisingly well-preserved booklet produced following my great-great-grandmother’s funeral, at Grace Church in New York, on 1 August 1867. 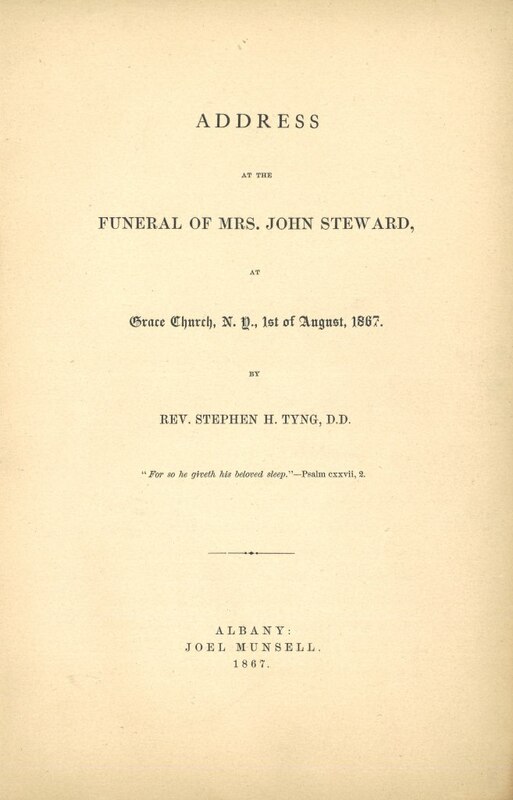 The booklet’s sturdy midnight blue cover stock offers no hint of the contents, an admiring Address at the Funeral of Mrs. John Steward given by the Rev. Dr. Stephen H. Tyng, the long-time rector of St. George’s Church on Stuyvesant Square. “If you survey the history of her life as a mother, you will be ready to say that her whole heart’s devotion was given supremely and always to the children whom God had given to her. She seemed to live but for their happiness and advantage. Her love cheered them, her watchfulness guided them, her piety taught and led them, her example blessed them, and her whole maternal influence was so gentle and uniform, and so uniformly Christian and right, that they can have no memory which will not bless her, and no association of thought with her, which will not guide and bless them. 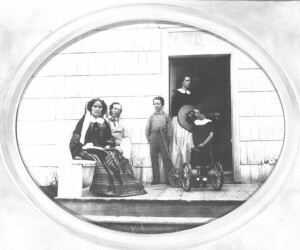 Catharine Elizabeth (White) Steward, seated at left, with her husband and children on the steps of the Steward Homestead. “You, her friends, who have known her most intimately, have seen and known all this, as she has walked before you, from her childhood to the hour of her death. Mrs. Steward’s daughter, Harriet Le Roy Steward (1842–1872), married Augustus Van Horne Stuyvesant at St. George’s Church in 1864. Her mother, Harriet Banyer (Le Roy) White (1797–1885), survived Mrs. Steward by seventeen years. She was the second eldest in a family of six: John Campbell White (1817–1904, later Goldsborough Banyer); Catharine Elizabeth White (1818–1867), who married John Steward in 1841; Ann White (1820–1914); Mary Martha White (1822–1903); Jacob Le Roy White (1823–1829); and Cornelia Le Roy White (1825–1911). John Steward outlived his wife by thirty-three years; he never remarried. Mrs. 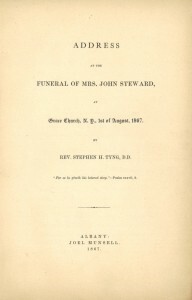 Steward had four children: Harriet [see Note 1]; John Steward Jr. (1843); John Steward (1847–1923), who married Cordelia Schermerhorn Jones in 1871; and Campbell Steward (1852–1936), who married Margaret Atherton Beeckman in 1885. My great-great-grandmother died at the Steward Homestead in Goshen, New York, on 28 July 1867. One could wish he had done so! As always, exciting to read such interesting information. I am glad that I have a family member equipped to save such precious memories safely and yet share them with the rest of us. Thank you, Laura! I’m having a great time going through the box — each foray is an adventure! What beautiful sentiments from Rev. Tyng! I especially love the words used in your title, and the last line describing their marriage- those could be, and should be, wedding vows. What a treasure you have shared- thank you! What a fabulous funeral address! Your ancestress was remarkable, indeed. I have enjoyed reading your stories about the box and your ancestors’ lives. What moving and heartfelt words. I wish we would still hear such beautifully composed expressions of praise and appreciation about worthy persons such as your great-grandmother. I think we as a society have lost the ability to use language in such elegant way. Thank you for sharing.